You know, I’m almost a little embarrassed to share this recipe. It’s so simple and delicious and I have been making it since college. You see, while in college, my friend Erin and her parents invited me along on two of their summer vacations. They are big scuba divers, so it was always to a beautiful tropical destination. I know, they really had to twist my arm! Our weeks were always filled with fun memories that we still joke about to this day such as an evening in St. Lucia when we were returning to our home for the week from dinner via an incredibly steep and windy road which also happened to be filled with gigantic potholes. We’d had a lot of beverages (water, and maybe some rum punches) at dinner – so our bladders were not too happy with the journey. So in order to take our minds off of the torturous ride, we decided singing along to the radio at the top of our lungs would help. What was on the radio? Celine Dion “To Love You More” – it was epic, especially when we got to the chorus. There was also the evening in St. Martin when we went out for a fabulous dinner overlooking the ocean – and I got mugged after Erin and I walked to purchase her some replacement flip-flops since hers busted as we were walking into the restaurant. All memorable times, but the most vivid memory was at a restaurant in St. Martin called Temptation. I remember exactly what I ordered, where we sat, talking to the piano player, and even our service. For dinner – I ordered the sashimi tuna with wasabi mashed potatoes. Y’all, it sounds simple – but the entire experience just stuck with me. In a shallow dish, pour teriyaki marinade and add raw tuna steaks. Marinate for 1 hour minimum, flipping halfway through the process. I threw mine in before I went to work one day – so they soaked up a lot of that goodness! 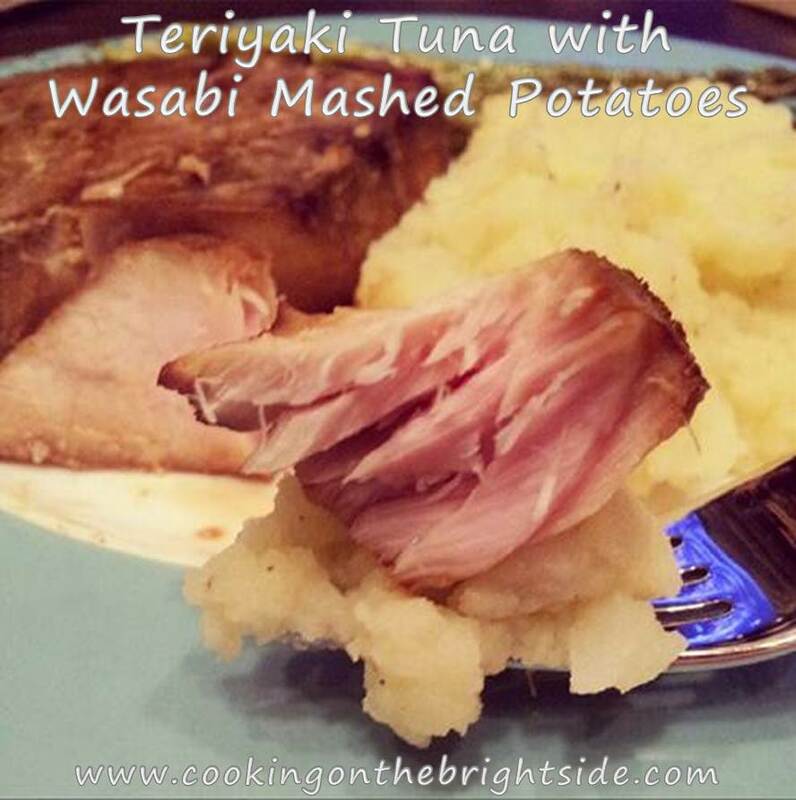 Remove tuna from marinade, reserve a few Tbsp. of what remains. Heat grill to medium-high and spray with nonstick spray. Add tuna steaks and grill 4-5 minutes per side to get a good medium center. Brush with a little more teriyaki when you flip them. While all of this is going on, make sure your potatoes are cooking so they’re ready when the steaks are! Bring a medium pot of water to a boil and add the potato cubes. Boil 7-9 minutes until pieces are tender when pierced with a fork. 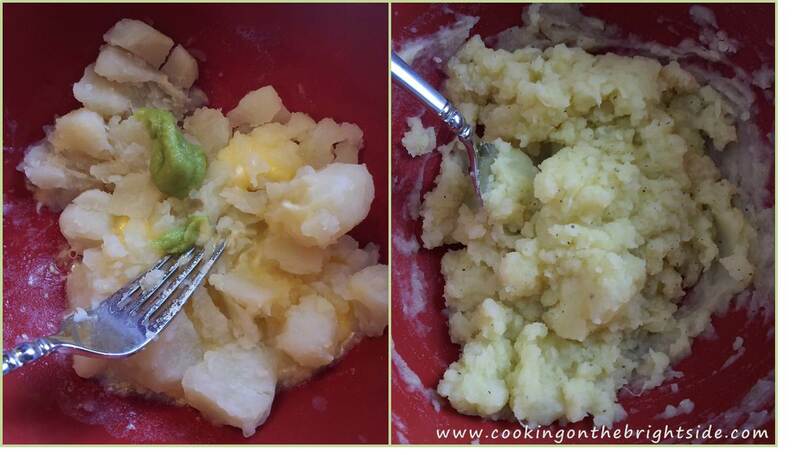 Drain potatoes and add to a small bowl. Whisk in milk, wasabi paste, margarine, salt and pepper. I usually add a little more wasabi, but all depends on preference and texture – if it’s too lumpy, add another splash of milk. I roasted some asparagus with a drizzle of peanut oil, some soy sauce and topped with sesame seeds – the perfect addition to this plate of deliciousness. 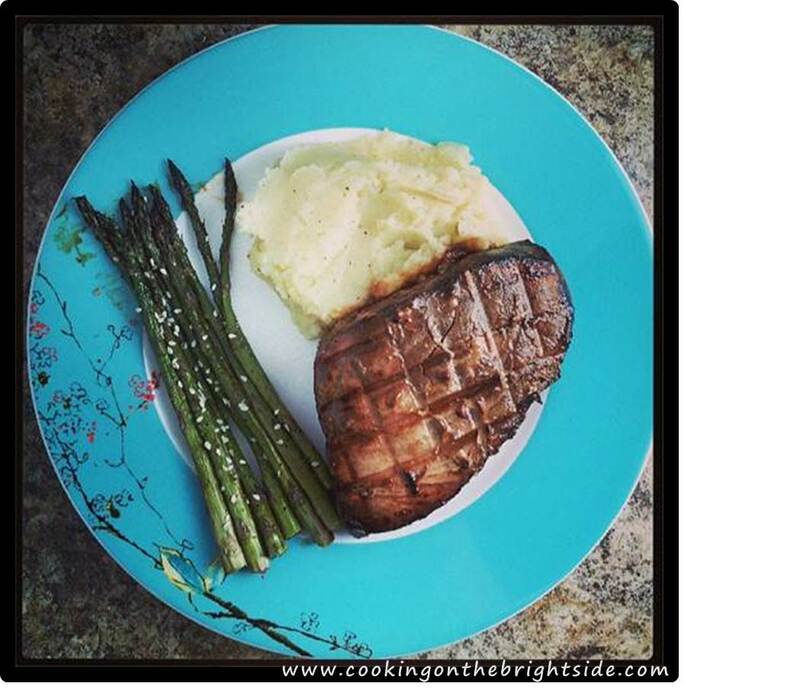 Let me know what you think if you try this recipe out, it’s definitely one of my favorites!